As a follow-on from this afternoon's blog post, Corinna asked if I could share exactly what I used, and what you would need and where to get whatever, to make these soaps. I'm no expert, but I have made soap since the children were little, and made lots and lots of melt and pour soaps when they were at primary school for stalls and fetes, so here goes. The soaps I made are all what is known as melt and pour soaps and are perfect for beginners and those who would like to make their own soap but are nervous about using lye and don't want to wait six weeks to use it. They are made from a glycerine soap base. Glycerine is very gentle, and moisturising - perfect for dry skin, and as an anti-ageing ingredient in soap. Melt and pour soap bases come in a number of different varieties, the most common being clear. 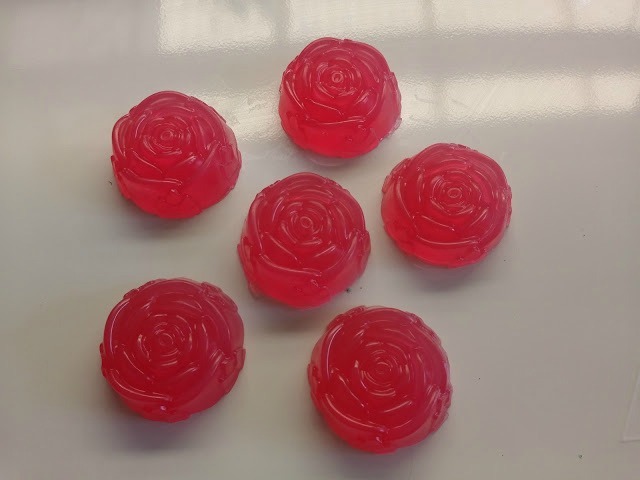 This is the base I used to make the rose soaps. I tinted it pink and added fragrance oil to scent it. 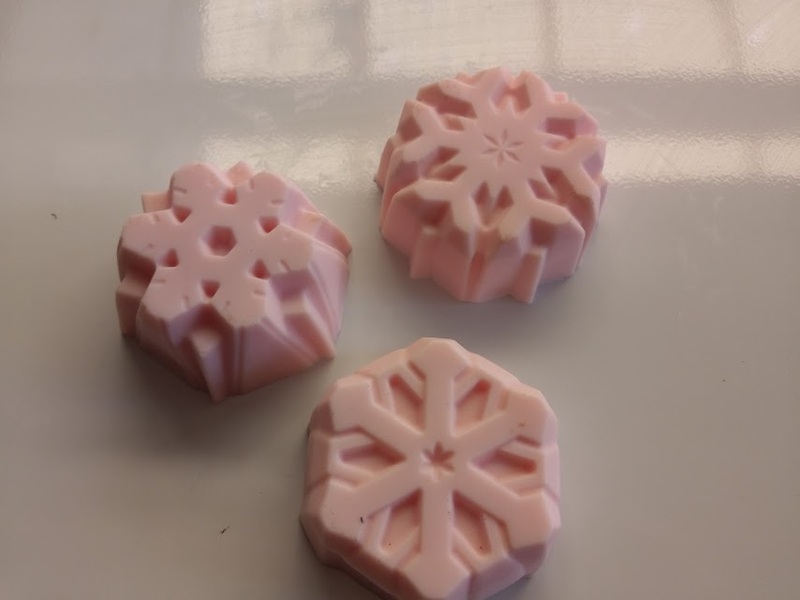 The snowflake soaps were made from a goats milk and glycerine base, and tinted pink. And the Christmas trees were made from a coconut oil and glycerine base and I tinted them green. Step 1. Prepare your moulds. You can use whatever you like, I use silicone cake moulds because they're cheap, readily available in a lot of different shapes and most importantly, the finished soap is easy to pop out. If you are using silicone moulds, put them on a baking sheet to keep them stable. Spritz the inside of the moulds with the isopropyl alcohol. Step 2. Cut the soap base into 2cm squares. This ensures it melts evenly and quickly, and doesn't turn into a giant, unmanageable glob. Step 3. Bring the double boiler to the boil. Put the soap base into the double boiler, turn the heat down so the pot is simmering and stir. Keep stirring until all the base has completely melted. Depending on how much base you have in the double boiler it can take a few minutes. Watch the temperature of the base, and keep it under 50 degrees F. If it goes over 50 degrees, it will still be good to use, but the finished soap won't be glossy and bright. I use a skewer to stir so it gets between all the little cubes and keeps them moving. Step 4. Once the base has completely melted, you can add the colour if you are using it. Remember, less is more. It is easier to add a drop to increase the intensity of the colour rather than over-colour and end up with something you don't like. Add the colour by the drop, and make sure to stir it in completely. Again, this can take a minute or two to get an even colour distribution. Just keep the double boiler or bowl over the hot water. Step 5. Add the scent, again remembering that less is more and you can always increase the intensity of the fragrance. Stir well. Step 6. I use a clean, dry soup ladle to fill the moulds. As soon as they are full, spritz with the rubbing alcohol. This eliminates the little bubbles that are sitting on top of the soap, giving it a nice, flat surface when it dries. Set the baking sheet aside until the soap is set. This won't take too long - about 2 hours, but you can leave it up to 24 hours if necessary. Step 7. Once the soap has hardened or set, turn it out of the moulds. Trim off any excess drips with a sharp paring knife. Wrap the soap immediately. This prevents the "sweating" that is a common feature of glycerine based soaps. They can be used straight away, there is no need to wait to use these soaps. Seven steps sound a lot and complicated, but they are all very quick and simple. It takes about half an hour from start to final spritz. Cost: Depending on the cost of your base, making 1kg of melt and pour soap can cost as little as $15. Adding colour and fragrance will increase the cost by about $1.50 per kilo. Other bases are a $1 - $2 per kilo more expensive. How many soaps you'll get will depend on the size of your moulds. The snowflakes are large, I get 12 from 1kg if I fill them to the top. The roses are smaller and I get about 15 if I watch how I fill them. 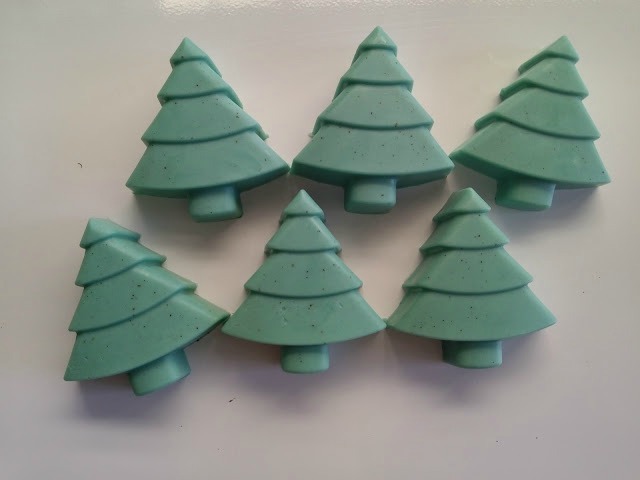 The Christmas trees make 12 bars from 1kg of soap base. Bases come in either .500g or 1kg blocks. They do come in bigger blocks, up to 20kg, but 1kg is a good size to manage at home for soap making. Cut the base into 1cm squares, but no larger than 2cm. This is a manageable size to stir and melt before it gets too hot. Use only soap colours. Don't be tempted to use food colour - it stains! It stains you, the bath, the shower base, the face washer - it's meant for icing, not soap. I use liquid soap colours. About 5ml per kilo of soap base gives a nice colour density, but you can use more or less to get the density you want. When it comes to fragrance, you can use essential oils, as long as they are skin-safe (not all are suitable, check the bottle label). Essential oils don't last long, that's fine if you don't want the fragrance to last. And you will need to use more. Fragrance oils work very well in soaps. They last longer due to the formulation and you don’t need to use as much. A thermometer that clips to the side of your dish is ideal. It keeps it out of the way, and you can easily keep an eye on the temperature of the base as it melts. I have bought most of my moulds from op shops for $1 or $2 each. The most I've paid for a mould was $3 for the Christmas tree mould. Look at stores like The Reject Shop too, they often have cute shapes in silicone cake moulds for just a couple of dollars. But you can use anything as long as you can get the hardened soap out. For the Gardener's Soap bars I use an old aluminium bar cake tin, lined with clingwrap. Cardboard cartons, paper boxes, acetate shapes can all be used as moulds for your melt and pour soaps. This is a local (almost!) to me company. They are Victorian based, and a family owned and run business. Little Green Workshops has a large range of all soap making supplies but they also have an excellent range of kits, aimed at the beginner to the more experienced soap maker. The kits are ideal, coming with everything you need to make your soap, including the moulds, colours and fragrances and a detailed instruction booklet and a wonderful chart showing how to mix the primary colours to create secondary and tertiary colours. Based in Western Australia, this company also sells the melt and pour base, and a limited range of kits. The kits are aimed more at the experienced melt and pour soap maker. They also come with detailed instructions on how to create the soaps. Most chemists/pharmacies stock it. It's not expensive and a bottle will last for ages, but I found Chemist Warehouse was the cheapest stockist near me. It can also be used in the laundry as a stain lifter and for cleaning and sanitising around the house. You may have an outlet near you that sells soap making supplies. If you search on "soap making" and your area, I'm sure you'll find plenty. Do your research and compare prices, not just on the base and other ingredients, but on the delivery fee too. If you have any questions, just ask them in the comments below and I'll do my best to answer them for you.